Apple's suppliers are said to be struggling from allegedly weaker demand for new iPhones, a report claims, with Apple accused of having trouble determining interest in the market, despite demonstrating the opposite in its quarterly results forecast. Recent reports of Apple's suppliers indicate that the company has reduced its orders for iPhone components, adjusting down the amount required to keep up with current demand. The reduced orders have led to suppliers warning of weaker than expected results for their financial results, which has led to some analysts and investors determining the latest iPhones aren't as popular as they could have been. According to the Wall Street Journal, the choice to offer more models and lower-than-expected demand for the 2018 refresh has "created turmoil" in the supply chain. Sources claim Apple's actions have made it harder to predict the component order levels the company requires for the amount of iPhone XS, XS Max and XR units it wishes to produce. Apple's decision to cut production orders for all three models is said to be frustrating to executives at suppliers, as well as its workers. Further notifications from the last week from Apple to suppliers that it has cut its iPhone XR orders again is also said to be making the situation worse for those involved. 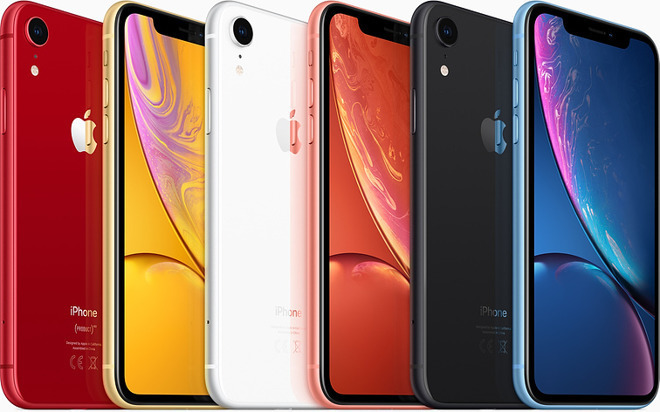 Forecasts for the iPhone XR are said to be especially problematic according to the report, with Apple slashing production plans in late October by up to a third of the original 70 million units ordered between September and February. What is less clear is how the "cuts" compare to normal seasonal reductions in production, as they do not appear to be impacting Apple's entire array of suppliers. Apple's decision to stop providing unit sales figures is also said to be a problem, as it will make forecasting seasonal sales much harder to predict. Production changes are certainly not a new phenomenon, especially in the case of the iPhone. Reports over the years have offered similar observations that Apple orders confidently at first, before cutting orders later on. "Doing business with Apple is very risky as it often reverses what it has promised," one supplier executive suggests. The claim that Apple is struggling to predict demand may be suggested in the report, but its most recent quarterly results advise otherwise. In the results, Apple forecast an unusually wide revenue range of between $89 billion and $93 billion, twice as wide as usual, potentially indicating some level of uncertainty for unit sales in the period. There has also been a warning from CEO Tim Cook to anticipate a softer forecast than analysts would usually expect, partly caused through the relatively late introduction of the iPhone XR and foreign exchange rate issues. Cook has also previously suggested that relying on supply chain metrics to predict iPhone demand is folly. "I've never seen one that's even close to accurate," the executive said in 2015 regarding supply chain estimates, with variations on the same theme since.